Find your magicFor the Owens family, love is a curse that began in 1620, when Maria Owens was charged with witchery for loving the wrong man.Hundreds of years later, in New York City at the cusp of the sixties, when the whole world is about to change, Susanna Owens knows that her three children are dangerously unique. Difficult Franny, with skin as pale as milk and blood red hair, shy and beautiful Jet, who can read other people’s thoughts, and charismatic Vincent, who began looking for trouble on the day he could walk.From the start Susanna sets down rules for her children: No walking in the moonlight, no red shoes, no wearing black, no cats, no crows, no candles, no books about magic. And most importantly, never, ever, fall in love. But when her children visit their Aunt Isabelle, in the small Massachusetts town where the Owens family has been blamed for everything that has ever gone wrong, they uncover family secrets and begin to understand the truth of who they are. Back in New York City each begins a risky journey as they try to escape the family curse.The Owens children cannot escape love even if they try, just as they cannot escape the pains of the human heart. The two beautiful sisters will grow up to be the revered, and sometimes feared, aunts in Practical Magic, while Vincent, their beloved brother, will leave an unexpected legacy. 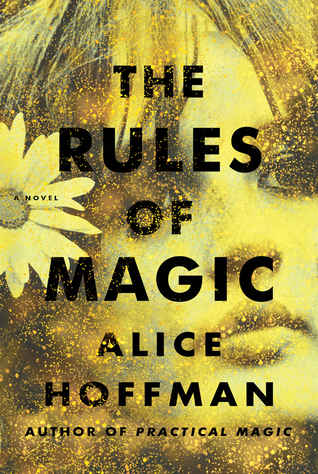 The Rules of Magic is a whimsical tale that will have you fall deeply and madly in love. Franny, Jet and Vincent are unlike any other characters I have ever read. They are charming, intense and so full of depth. Though I just spent a whole book reading about them, I still feel there is so much that I do not know. Almost like a delicious secret is still being kept. The beauty in characters does not end there though. The character cast is large and each one blesses it's readers with their own unique story. Your heart will become fuller after reading this novel. The Rules of Magic is a fantastical tale that will make you giggle with laughter, shed tears and shake your head in amazement. The Rules of Magic will leave you with an indescribable feeling but knowing that you just had a beautiful and memorable reading experience. "Writing itself was a magical act in which imagination altered reality and gave form to power"
'When you are young you are looking forward and when you are old you are looking back"
"She opened a book and was therefore saved, discovering that a novel was as great an escape as any spell."